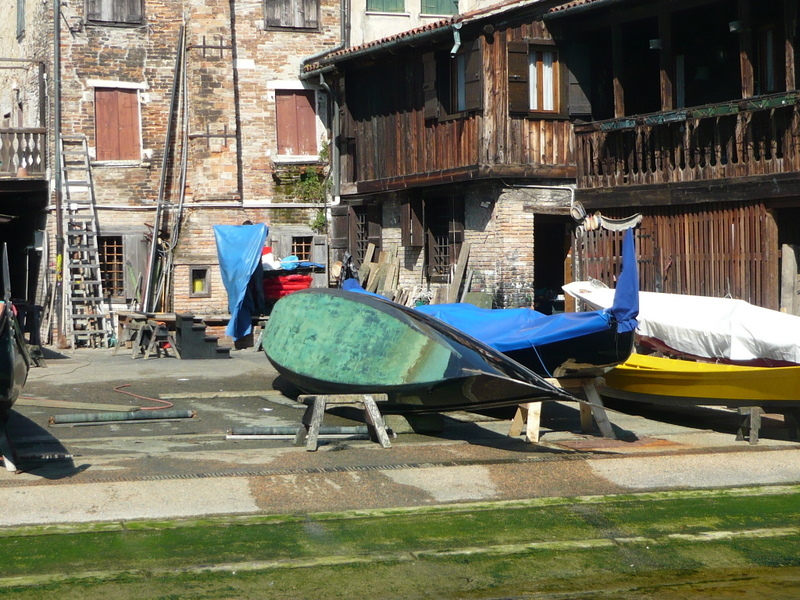 If you decided you just had to add a gondola to your collection of vintage Rolls Royce automobiles, antique beanbags, etc., then you would probably head to the squero (boatyard) near the Chiesa San Trovaso, in Dorsoduro. But, you wouldn’t just pick one off the shelf, laddie. These beauties are custom made; that may be why you are called a “custom-er”! 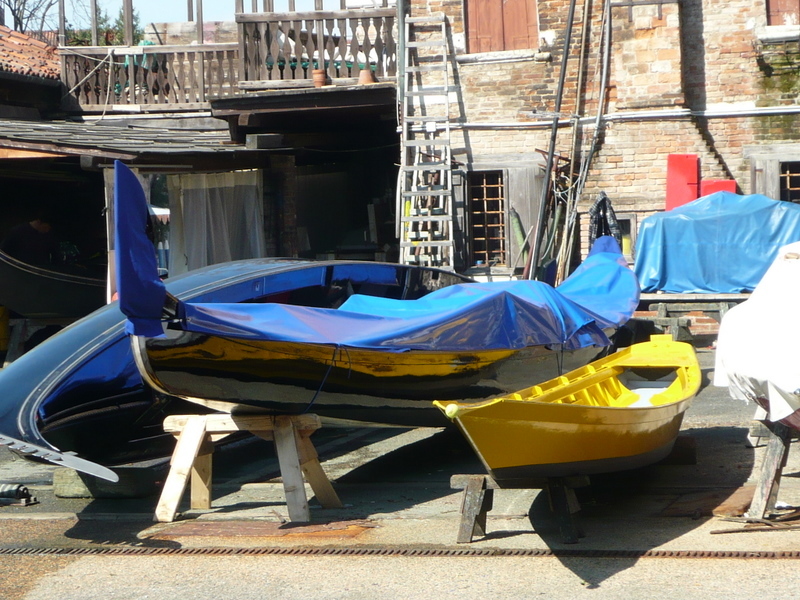 Comme je n’ai ni la Rolls, ni la Jaguar, ni la Ferrari pour l’accompagner, alors je crois je préférerais uniquement un petit sandolo pour me promener sur les eaux des rii, mais pour cela il faudrait que je vive toute l’année à Venise ! Watch for my next post; I may have just what you want! I cannot confirm Andrew’s tale, but I have heard the same one. Andrew, please put that on your “To find out when I have a spare moment while I am in Venice” list. 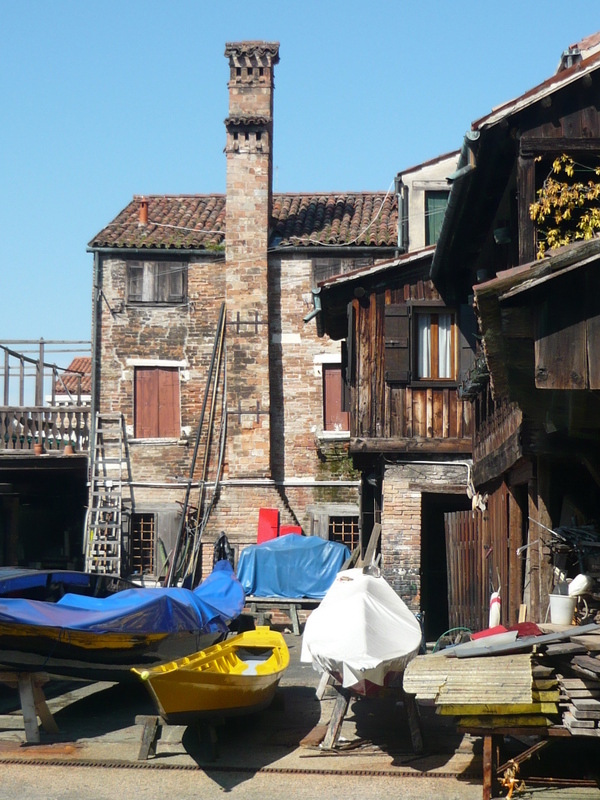 I heard that it looks like an Alpine cottage because the first gondola builders were from the Dolomites. They were used to working in wood and were able to adapt to boat building. Be interested if anyone can verify this. Can I get a cute hunky gondolier to go with it? Wonderful photos! I’ve walked by this place but never stopped to really look or take pictures. I’m intrigued by those golden leaves in the second story in the first photo. House plants? I’d love to be able to get right inside there, to see these craftsmen at work. Yes, that would be a plant of some description in the first photo. The workshop looks like an Alpine cottage. I’ll try to get more comprehensive photos next time.